Since the disease emerged, PRRS virus has disseminated worldwide, gained genetic diversity and, in particular cases, increased its virulence. The basis for the virulence, however, remains unknown, despite being investigated with a variety of different approaches. Generally speaking, it seems that PRRSV1 strains induce less severe respiratory disease than strains belonging to PRRSV2. Also, the most virulent outbreaks reported until now have always been related to PRRSV2 isolates. However, it is important to emphasize that there is a severe lack of data on the pathogenesis of Eastern European isolates (subtypes II, III and IV). Therefore, we cannot completely rule out the possibility that highly pathogenic strains could exist within PRRSV1. 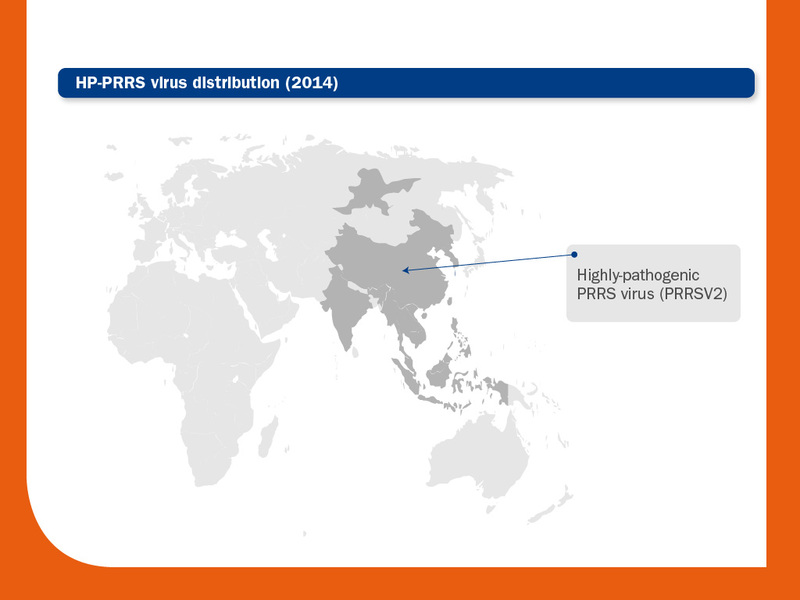 Irrespective of subtypes and species, PRRS virus isolates vary markedly in virulence. Thus, at a regional level, it is possible to detect higher and lower virulent strains. Atypical pathogenic PRRS virus strains have emerged around the world. The risk of a new highly-pathogenic PRRS virus emerging and/or its worldwide spreading is a real threat. Subtype III in Europe (2007): Karniychuk and collaborators (2010) investigated the pathogenesis and antigenic characteristics of PRRSV1 Lena strain, which was isolated in 2007 from a Belarusian farm that experienced reproductive disorders, a high mortality rate before weaning and up to 70% of mortality in growing pigs. The main conclusion of the study was that Lena strain is a highly pathogenic PRRS virus strain belonging to subtype III (PRRSV1) and that compared to a conventional subtype I strain from Belgium, Lena infection caused obvious clinical signs. In Lena-infected pigs, high fever, anorexia and depression were the most evident signs. Eventually, four pigs out of ten piglets included in the experimental infection died after the Lena inoculation. It seems that bacterial complications were enhanced in Lena-infected pigs. Also, significant virological differences were observed between the subtype I strain from Belgium and Lena. Viral titres in sera and tissues from Lena-infected pigs were statistically higher. The higher replication observed for the Lena strain could be due to its capacity to replicate in a widerange of macrophage subpopulations. In summary, Lena strain induced high fever, high systemic viral load and strong inflammatory response. Subtype I in Europe (2002-2003). In Western Europe, atypical PRRS outbreaks have been described in Italy. Those outbreaks were characterised by two waves of abortions and mortality even in adults. Sows were acutely anorexic, with high fever (>41°C) and sporadically had respiratory symptoms. Subtype I in Europe (2013-2015). PRRSV1 field strains AUT13-883 and AUT14-440 isolated from two farms in Upper Austria had genetic and phylogenetic similarities to East Asian PRRSV1 strains. When the above mentioned strains and one strain isolated in Germany in 2009 were compared in an animal trial, AUT14-440 was the only one to cause clear respiratory distress in pigs, to be detected in high amounts in blood -with titres of AUT14-440 exceeding those of the other strains by up to 100-fold-, and to decrease the daily weight gain. In pigs infected with AUT13-883 strain moderate to severe lung lesions were found. Numerous severe PRRS outbreaks have been reported from North-American farms, mainly in the U.S.A.
Isolates 142 and 73 / JA 142 and SDSU73 (1996). Atypical PRRS clinical outbreaks known as Swine abortion and mortality syndrome (SAMS). It was mainly characterised by mid- or late-term abortions of 10-50% of the sows in a period of a few weeks. Sows and gilts had fever and were anorexic. Mortality was from 5% to 10% in the breeding herds. An increase in preweaning mortality and a decrease in nursery pig performance were also observed. The wild-type isolates involved were known as 142 or 73, because of their RFLP patterns. Isolates 184 (2001 and 2006). RFLP 1-8-4 or Strain MN184. It caused high morbidity (50%) and mortality (20%) rates. ORF5 nucleotide sequence analysis and comparison with other PRRSV2 strains demonstrated that MN184 were significantly different from previous strains. Three quite variable regions were identified, corresponding to nsp1β, nsp2 and ORF5. Nsp2 shared only 66-70% amino acid similarity to other North-American PRRS virus nsp2 proteins. Isolate MN414 (2014). It caused high morbidity and mortality in sows and piglets, even though the herd was vaccinated quarterly. It spread rapidly and it seems that it was the result of evolution from virulent field virus populations rather than recombination with a vaccine strain in the herds. Highly-pathogenic PRRS virus (HP-PRRSV): a special case. In June 2006, a very severe disease called Porcine high fever syndrome emerged in Jiangxi province (People’s Republic of China) and rapidly spread throughout the country. By the end of that year, the disease had already been detected in 16 provinces affecting over 2 million pigs with about 400,000 fatal cases. Subsequent analysis demonstrated that the disease was caused by an atypical highly virulent strain of PRRS virus. Since then, highly-pathogenic PRRS virus (HP-PRRSV) can be isolated around the East, South and North of Asia, including China, Vietnam, Bhutan, Cambodia, India, Indonesia, Laos, Malaysia, Myanmar, the Philippines, Russia, Singapore, Thailand, etc. Nowadays, it has become endemic in some of these countries and continues to have a devastating economic impact in all of them. During outbreaks, high fever, cough, anorexia, red discoloration of the body and blue ears, as well as multiple visceral lesions can be observed, with a morbidity close to 100% and a high mortality, even in adult pigs. Hemorrhagic lesions are commonly observed in lymph nodes, lung, spleen, liver, heart and kidneys. In fact, PRRSV antigen can be detected not only in lungs and lymphoid tissues but also in liver or kidneys. According to ORF5 phylogenetic analysis, it seems that HP-PRRSV might have evolved from strains previously detected in China. More recently (2013-2014), new isolates (JL580 and HLJ58) with a different genetic background from those isolates observed in 2006 have emerged. According to the analysis, the new isolates NADC30-like have been recently introduced from North-America and have undergone genetic exchange with the classic HP-PRRSV strains, all on a relatively recent time scale. Therefore, it seems that importation and recombination have been responsible for these latest emergence of highly-pathogenic strains. These new strains have spread to several provinces in China and seems that have a high pathogenicity. Although the basis for HP-PRRSV virulence remains unknown, some authors claimed that Nsp2, Nsp9 and/or Nsp10 may be involved in the fatal virulence of HP-PRRSV. In this sense, nsp9 and nsp10 seems to be closely related to the replication efficiency of the HP-PRRSV strains in vitro and in vivo, and therefore, to virulence and pathogenicity. Other studies have concluded that aberrant immune responses triggered by HP-PRRSV infection could be closely related to acute lung injury. 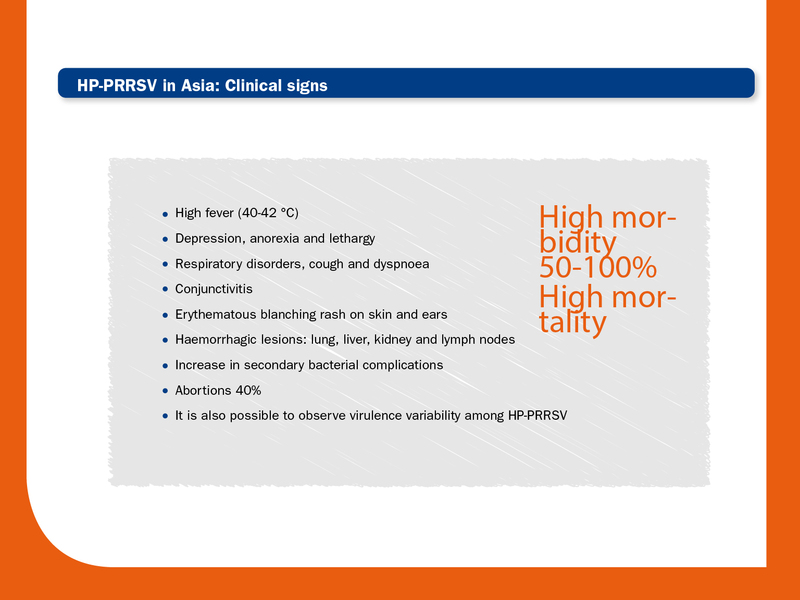 In any case, HP-PRRSV strains may infect a broader population of cells, which means greater distribution of lesions in tissues. Secondary infections –Streptococcus suis, Haemophilus parasuis, etc.- also seems to play an important role in the severity of disease caused by HP-PRRSV.